Wow...I was about to sign off but when I passed by my blog, I saw a note from my dear cyber brother Denz. 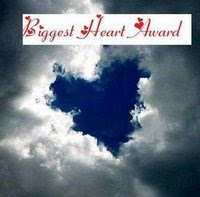 He is giving me this Biggest Heart Award. Awww.....that's really sweet of you Denz. Back atcha because I really believe that you have the biggest heart as well!!! This goes to all of you my dear friends....you have the biggest heart for finding the time in your busy sched to come and visit me here. So, please grab it and post it on your blog to show the blogging world your BIG HEART!!! !